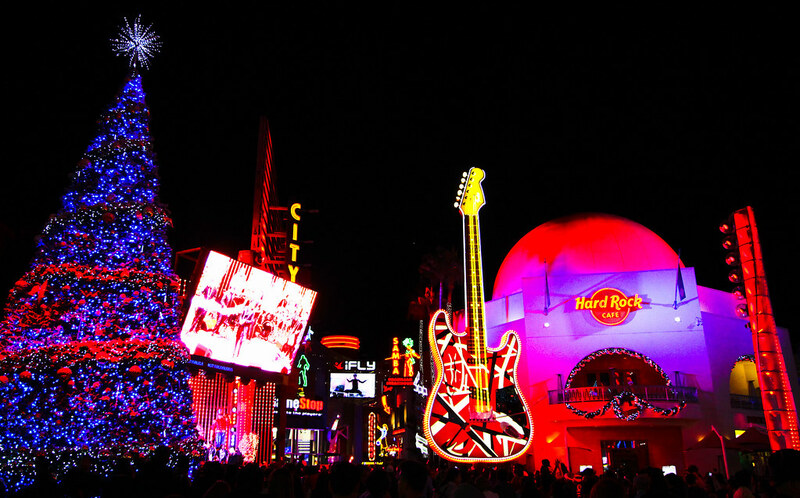 Universal Studios was high on my to-do list ever since we decided we’d be going to the US. I’m a sucker for high-tech rides and coasters. Being a movie fan, though, I was keen to go on the studio tour, which is the reason the park opened in the first place. We started off early by catching our hotel’s shuttle over to the bus depot, intending to get to the gates before they opened. Unfortunately the buses weren’t running when we got there, and weren’t due to start up for another half hour, so we used an Uber cab to get over there. It delayed us a little bit, but when we got there it was surprisingly quiet anyway, so we needn’t have worried. We studied the map beforehand to draw up our battle plans. We purchased our tickets, opting not to go for the more expensive front-of-line tickets given the thin crowds. We’d read some guides on the best way to tackle all the rides and attractions, so first off we headed for the studio tour. We piled in to a four open-carriage tour bus and set off. The commentary of the tour guide is supplemented by humorous videos staring Jimmy Fallon. We were sitting in the front of the third carriage, and couldn’t really see the TV screen from where we were sitting – however it does give you a good view for everything else. The tour takes you through both the universal front and back lots. The front lots have all the production offices, and the back lots have all the stages and sets, which still get a lot of use. We even went past a crew shooting some TV commercial. I can understand why they still have their New York and European city sets still up – they seem to get a lot of use. But it’s a bit baffling as to why they still have a wild west back lot – I can’t imagine there’s much call for it anymore, and it looks extremely dated. Though it was used in a Community episode, so I guess it’s not completely useless. Apart from current working sets, there are also some remnants of sets, including the crash scene out of War Of The Worlds, the Desperate Housewives street, and the Bates Hotel out of Psycho. I was a little disappointed that the Back To The Future clock tower no longer features on the tour. King Kong 360 3D is an attraction coupled with the studio tour. It was designed by Peter Jackson and his WETA workshop to be a mixture of CGI, simulator and practical special effects. The tour carriages pull in to a darkened cave area with two huge IMAX screens curved around the tram displaying the lush vegetation of Skull Island, which is where King Kong was set. Before long though a few dinosaurs get interested in having a chomp on the tour guests, and Kong turns up just in time to stop them. Some prehistoric fisticuffs result, and the tour carriages are knocked around as the fight goes on. The 3D effects aren’t the most immersive, and there’s a lot of stuff going on so if you try to see everything you’ll end up taking in less than you would if you were just looking to one side, but overall it’s a great experience with some excellent effects. Check out this in-depth review for more details. At the end of the studio tour you get a final video from Jimmy Fallon who busts out a guitar and sings a song for you, wishing for you to “Have a Tram-tastic day!“. Super catchy song which we ended up humming on our way off the tram. I’m surprised it hasn’t made more of an impact online. Thanks Jimmy Fallon – we will! 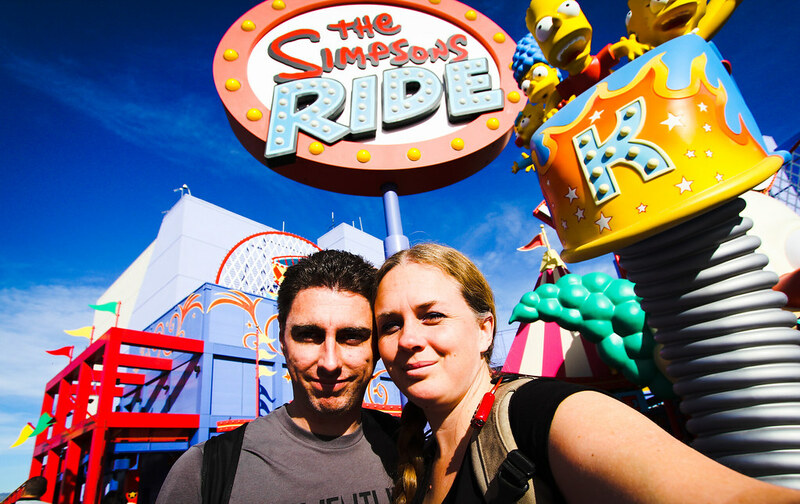 Next up was The Simpsons ride, which is a simulated roller-coaster. As you wait to enter the ride, you watch a movie with Krusty explaining how we’re about to ride the new attraction at Krustyland, and the Simpsons are picked to be the first on the ride. However we also learn the murderous Sideshow Bob has escaped from prison and is out for vengeance against both Krusty and the Simpsons. Bob manages to infiltrate Krustyland, takes control of the park and forces us to set off on the ride while he sets about destroying it, as well as everything else. What follows is a manic ride around Krustyland as our coaster cart is knocked all across the park, and then eventually through Springfield itself. Even though the simulator doesn’t actually fall, the visuals fool your brain in to feeling a strong sense of motion and vertigo as you hammer down a large drop or fly through the air. 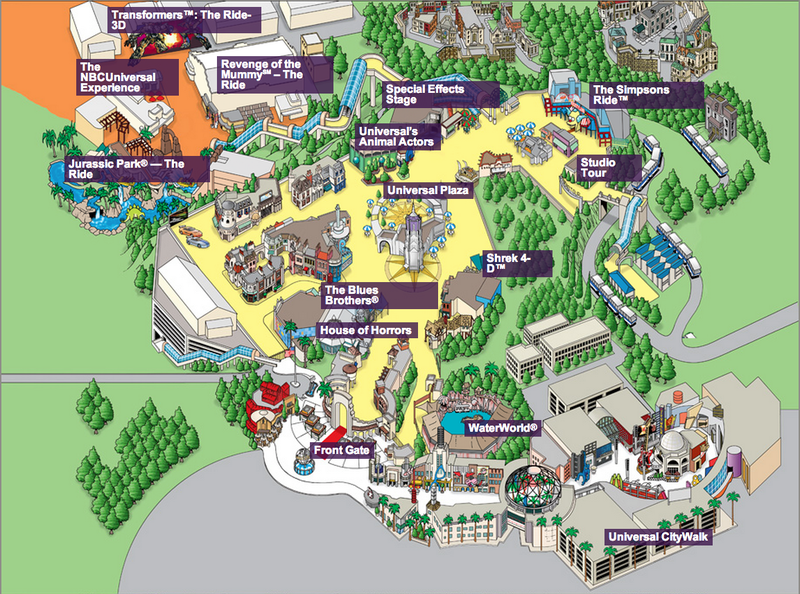 Check out the Simpson Ride Wiki page for more info. After a bite to eat (definitely have breakfast before you arrive if you get the chance, park food is expensive and you can’t bring any food in with you other than fruit and baby food) we saw the Special Effects Stage Show, where they demonstrate a number of both practical (in-camera) and computer-generated effects. This was quite an entertaining show, with members of the audience brought on stage to pretend to rappel down buildings, or to stand in front of green screens to be terrorised by giant monsters. After that we headed down to the lower part of the park. Seriously lower – you have to go down a series of three large escalators to get down there. On the way is an apparently often unappreciated feature of the park – amazing views over the San Fernando Valley. 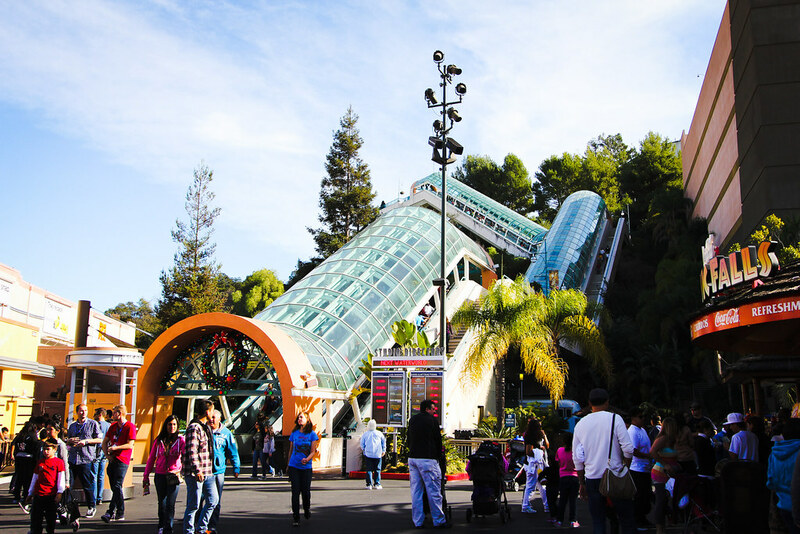 The lower part of the park features three rides – Transformers, Jurassic Park, and The Revenge of the Mummy. Transformers: The Ride-3D (4D really, as it also employs water and fire effects) is another simulator ride based on the Michael Bay movies. While waiting in line you are told that the NEST base which houses an important relic called the ‘all-spark’ is under attack by the Decepticons. You team up with the Autobot ‘Evac’ (the simulator car you’ll be in) to get the all-spark out of the base and to safety. As you move out of the base and in to the city you come under heavy attack, with Decepticons trying to stop you at every turn. The simulator actually moves through tunnels which take you past a series of screens through which you view events unfolding. It’s a really freaking awesome ride which genuinely wowed me. By far my favourite – I ended up going on it about five times throughout the day! Amanda was too hesitant to come on the Jurassic Park ride at first, so I went on by myself and discovered the joys of the “Single Rider” line. Skipped the queue and got on and off the ride within 10 minutes. 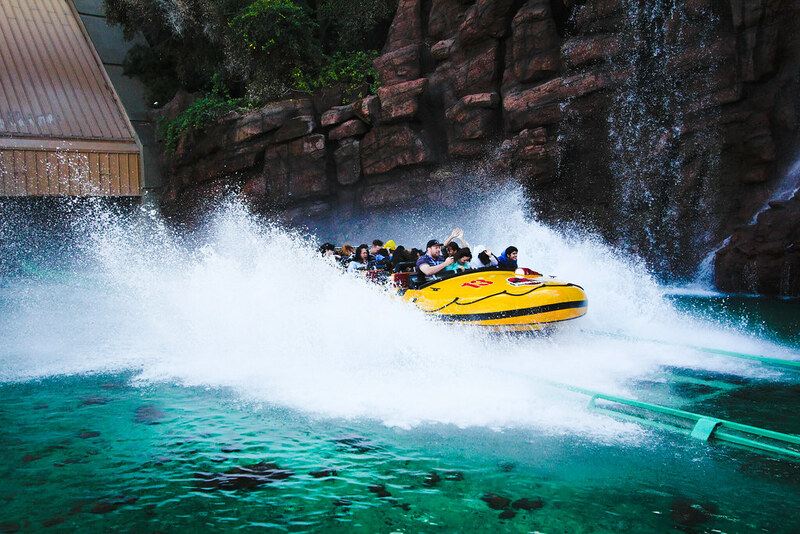 The Jurassic Park ride is a water flume ride, and it’s fairly basic. Your boat takes you in to Jurassic Park, you see some relatively unimpressive animatronic dinos, something goes wrong, you get diverted up through an escape route, dinos “chase” you (i.e. pop out from the sides of the track or the roof above you), leading to what the entire ride is really all about – a mammoth 84 foot drop (!!) down to a splash pool at the end. I was riding at the back of the cart the first time, didn’t get very wet and the drop was thrilling but fun, so I got off and convinced Amanda she should come on the ride. We ended up in the front of the cart, which offered a very different experience. We got very wet, and the final drop was buttock-clenchingly scary. Definitely the most intense ride in the park. Lesson learned, we didn’t go on that ride again! The angle of the exit makes the drop look way more gentle than it actually is. Very deceptive. The screams really should have clued me in. While Amanda dried out in the sun, I hit the Revenge of the Mummy roller coaster. I was fully expecting this one to be a thrill ride, but ultimately came away a little bit disappointed. After setting off and going through a few ‘spooky’ rooms almost like a ghost train ride, the persistently hard-to-kill Imhotep invites you to join him in everlasting life – but first you have to die. After this bombshell, the coaster rapidly accelerates (woo! Best bit of the ride) and shoots you in to a pitch black room with quick twists and turns, and a few UV-painted glow-in-the-dark monsters overhead. You reach a dead-end, come to a sudden stop, some scarabs attack you (vision of scarabs on screens around you while small brushes swish around your feet to freak you out) and after a few moments roll backwards quickly along the track (switching tracks in the process), slowing to a stop in the dark as a ghostly mist surrounds you. When it clears, you’re at the end of the ride. It was fun, but just not as thrilling as I was expecting. I read that the ride is the crippled version of the one at Orlando, which features an introductory video with the cast of the Mummy, and more footage during the ride. More info here. The House of Horrors, which Amanda passed on. Walk through a spooky house while actors jump out and scare you. Also has a few sets from famous horror films to add interest. I decided to go on the Transformers ride a few more times (so awesome!) then because I managed to get through so quickly, take one more ride on the Mummy coaster. Turned out to be a bit of a mistake – just as I was next up to get in the coaster cart, the ride broke down, and everyone had to get off so the ride could be reset. Though I was first on when it eventually came back online, the whole wait was about 15 minutes. I would have happily skipped that wait to go on either Transformers or the Simpsons rides again. For my troubles I was given a voucher for front-of-line on all but the two best rides (which I discovered only after trying to redeem it at The Simpsons ride), and a free drink from one of the stores, but which stores you could redeem it from was ambiguous. After waiting at one to be told I couldn’t use it there, I was told to go to another, and ended up waiting there in line for ages. All for a small drink. It felt like my reward for all the waiting I did was more waiting. I would’ve been better off not even trying to use the voucher at all. Universal also has a strip of shops next to the park called CityWalk, where we ended up going for dinner. It was damn near as bright and loud as Las Vegas, with a live band performing on stage, lots of neon signs, dancers, and large crowds. We went to the Hard Rock Cafe for dinner, mainly for the novelty value. As I expected, it’s really not anything special. Universal Studios Hollywood only sports a few attractions and though they’re fun, they’re fairly tame. If you’re a thrill-seeker looking for lots of heart-pounding rides, you’re better off looking elsewhere. That said, as a movie buff, and someone who loves flashy and expensive rides that exist solely to entertain him, I highly enjoyed Universal Studios and would certainly recommend going if you ever get the chance. Though it does sound like Orlando would be a better pick over Los Angeles.